I've tried a lot of different corned beef and cabbage recipes in the slow cooker. This by far is my favorite. The corned beef comes out deliciously tender, but not overcooked and the cabbage stays tender crisp (not mushy). I made this in my 5 quart slow cooker. (1) 3 to 4 lbs corned beef brisket (I throw out the seasoning packet that comes with it). Rinse the corned beef very well with water. 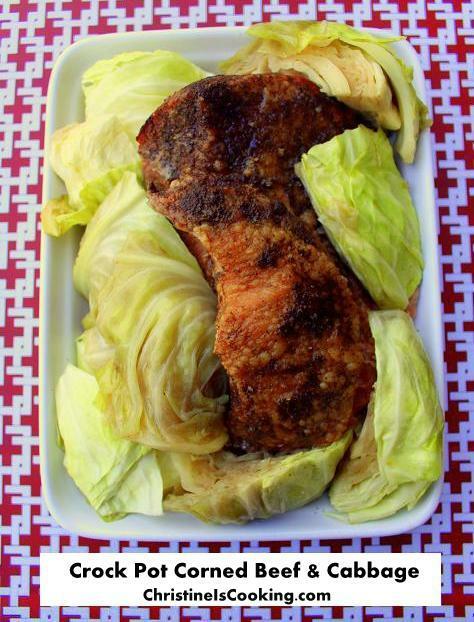 Add it to the slow cooker with all of the ingredients except the cabbage. Cook on low 6 hours. Add the cabbage wedges and cook one additional hour on low. I trim off any excess fat after cooking and serve it with whole grain mustard or horseradish sauce. You can season the cabbage further if desired. I like my cabbage tender crisp (not soft), so I add it to the slow cooker the last hour. If you like it soft, I would add it to the slow cooker the last 2 hours of cook time. You could add potatoes to this as well. I prefer to make my potatoes separate, but it is just a preference. Better Than Bullion Beef Base: If you don't know what this is, you can find it at most grocery stores in a glass jar near the bullion cubes.